Fashion is (finally) unraveling itself from the traditional etiquettes attached, slowly allowing changes whose benefits obtained will only allow this business to expand and grow. The most significant variations evolved around the inclusion of recent political and environmental statements, the inclusion of the LGBT community and more diversified catwalks than the previous years. But, what truly is catching the attention of both conventional and digital fashion addicts is the incorporation of new technologies, generating something only seen in movies. 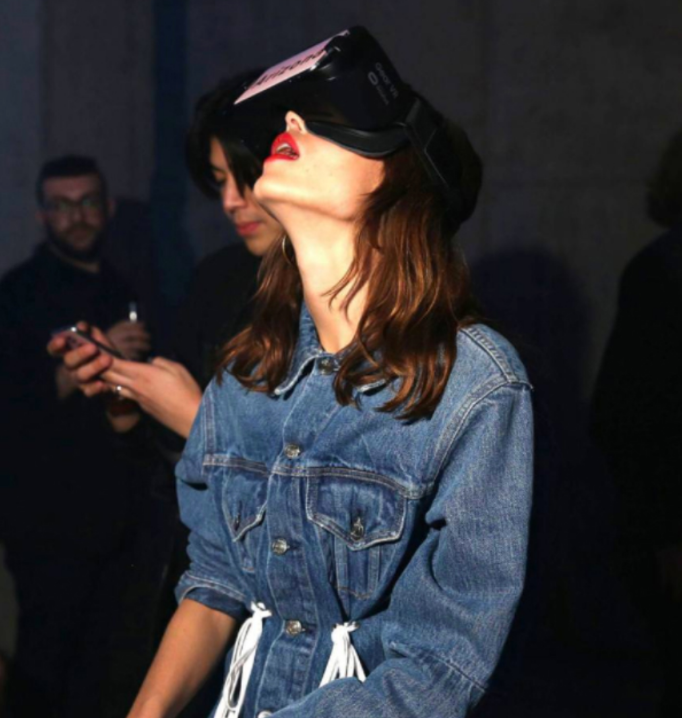 As technology advances daily, the future of Fashion is being shaped by its progress, such the uprising usage of 360 videos, Augmented Reality, and Virtual Reality. Through those tools, fashion is not only reinventing the advertising, manufacturing and retail facets, but also the various events hosted to showcase the new products and trends. With New York Fashion Week, technology was able to exhibit its vast potential linked to this area. In fact, a considerable amount of designers decided to acquire the digital world as a platform to exhibit their creations, in addition to the standard catwalk or showroom. An example for it, is Rebecca Taylor’s installation for the Fall 2018 collection which used projection mapping, VR and AR. While envisioning this project, Rebecca Taylor had magic and the consumer itself in her mind: the consumers would interact with the surrounding area while enjoying her new pieces. 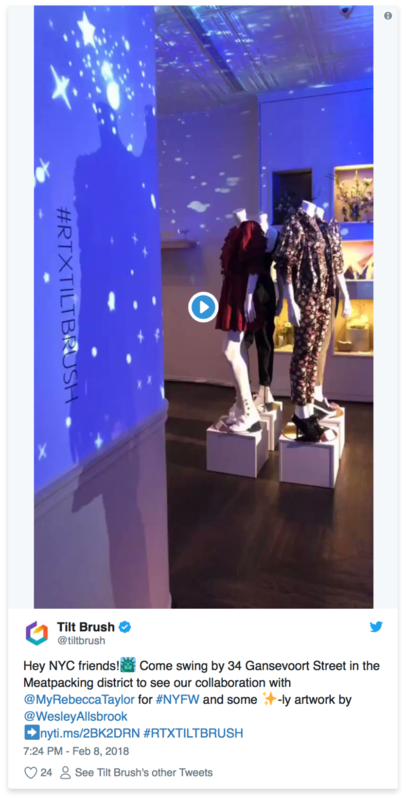 To do so, Rebecca Taylor teamed up with Tilt Brush by Google and Wesley Allsbrook, who designed the astonishing elements in the Tilt Brush App, creating luminous and celestial visuals, as well a moving light installation on the walls of her store. The users were able to digitally paint in a three-dimensional space, while projecting the various pieces of the new collection in VR. The users were able to digitally paint in a three-dimensional space, while projecting the various pieces of the new collection in VR. Beside launching unlimited fashion trends and styles, Fashion Week also inspires all of us into trying new beauty trends every season. For this reason, Perfect Corporation partnered with Maybelline, and created the Maybelline Fashion Week Series, within the YouCam Makeup app. Through AI and AR technologies that includes 3D facial, skin and texture recognition, the Maybelline Fashion Week Series enable the users to digitally try in real time three beauty looks from the runway, and purchase the Maybelline products used to recreate these looks. To continue on the marriage between reality and virtuality, Proenza Schouler organized a launch party of their first fragrance, Arizona, at Skylight Modern. Here, guests were fully immersed into the scenic beauty of Arizona?s natural landscapes through the beautiful orange, peach, pink and violet tones adopted in the color mists, the sandy mounds placed around the room, as well as in the desert-like custom cocktails offered. Moreover, they were able to experience the designer?s disconnected creative influence of Arizona through the usage of VR, which transported them in an exploration on the edge of the Grand Canyon. As for the retail section, new technologies have been applied in several areas. The latest inventions are smart fitting rooms and digital mirrors, named MemoMi. MemoMi was founded by Salvador Nissi Vilcovsky as an helpful tool to organize data and reduce waste, in terms of controlling and supplying the right amount of products, through the buying choices of the consumer. 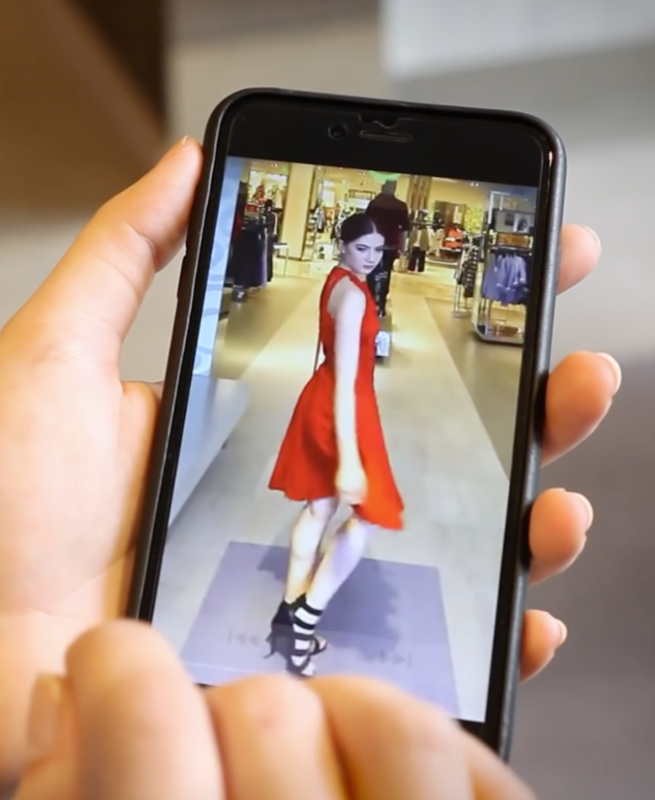 This enhanced fitting room can be found in various Neiman Marcus stores, and what differentiate it from the traditional fitting room is the ability of recording 360 videos of various outfits tried on, save them on screen and, through AR technology, the buyer is capable of virtually changing the colors. The latest inventions are smart fitting rooms and digital mirrors, named MemoMi. While the digital retail platforms are advancing, thanks to their convenience and efficiency, the real retail sector seems to be slowly going offline. In the past years, the digital frontier has always been associated with fast fashion brands, but recently two luxury brands, Burberry and Chanel, made the news with a partnership with a private digital retail platform, Farfetch. The partnership with Burberry (considered a digital enthusiast brand) will expand its inventory to more than 150 countries, and will supply a more immersive digital experience for the younger generations. On the other side, Chanels partnership wowed the audience: after years of neglecting e-commerce as a selling platform, Chanel decided to develop a digital experience which will utilize AR technology. The content has yet to be revealed, however it has been assuming to be either an AR that records the consumers preferences and suggest new products in the future, or a technological app that will download all the items looked in the store, and will showcase the persons size and personal taste.